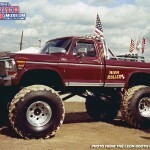 The owner of this truck was Greg Coston from Brandenburg, Ky. and was built by David Mattingly from Fordsville, Ky. 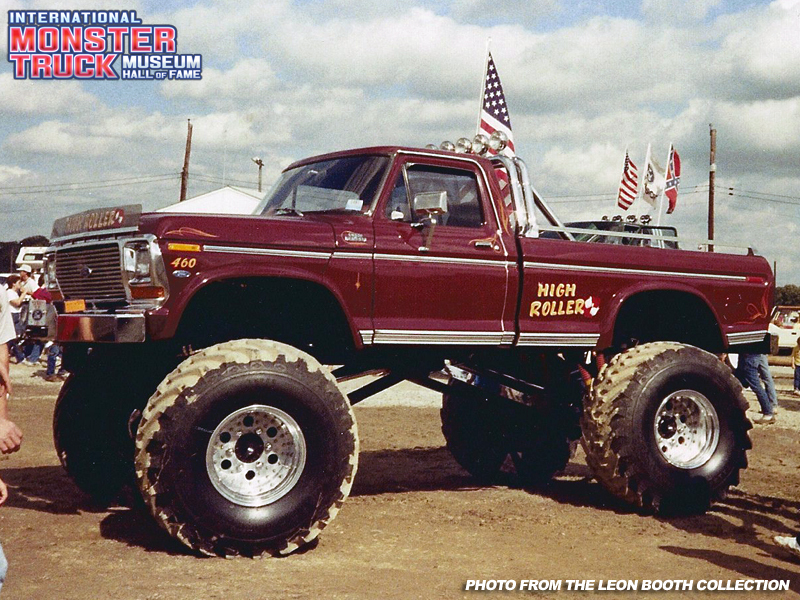 The wheels and tires were purchased from Bob Chandler and came off of the original Bigfoot #1 shortly after Bob went to the 66″ tires. The truck had 2 1/2 ton rockwells that steered front and rear and ran a 460 cu. tunnel ram 2 – 4bbl Holleys. Greg kept the truck for about 2-3 years and we did a lot of local car crushes and exhibits. I have a vhs video of us practicing car crushing in a field shortly after he got the truck and I have lots of photos. Greg sold the truck to what I believe was a Ford dealer in Arkansas. Greg passed away shortly after and now I treasure the memories. I remember the day this photo was taken, I was driving it when Bob Chandler pulled up beside me in the Bigfoot Shuddle and he complemented the looks of the truck. Those were some of the best times I ever had.